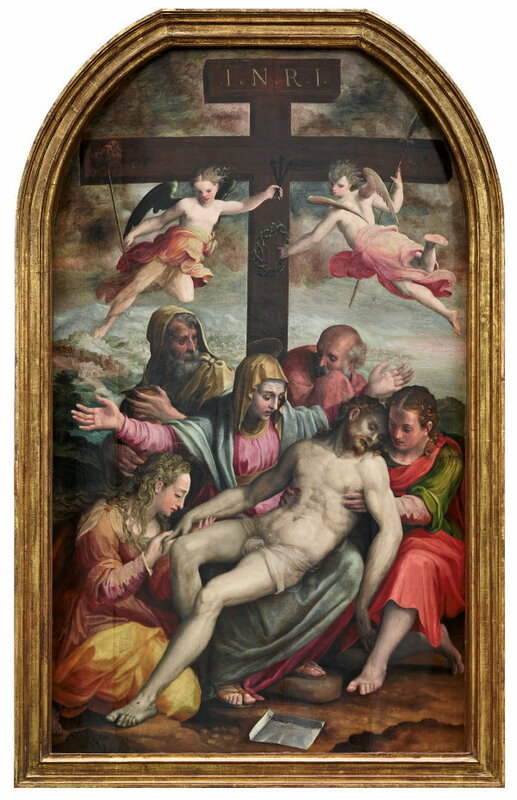 In this spectacular, if formulaic, altarpiece the decorativeness and artificiality of mannerism can be observed giving ground to the more robust dynamics of the proto-baroque style that emerged in Fontana's native Bologna during this period. The artist occupied an important place in Bolognese cultural affairs, while his daughter and pupil, Lavinia, established a significant reputation as a portraitist. Indeed, her fame eclipsed his for a time. The figures in this work derive from the standard Renaissance repertoire, their compression and colouristic variety are Fontana's own. He was especially adept at conveying a mood of heightened emotion within a limited pictorial space. 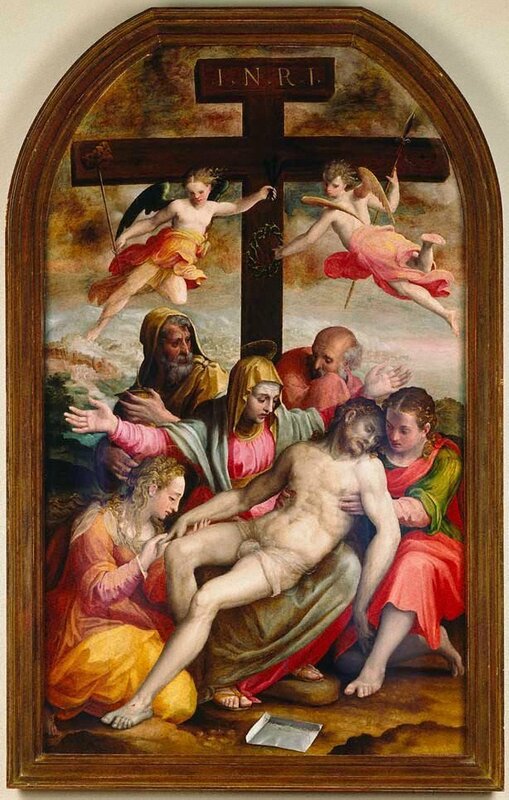 Even the air-borne angels bearing the instruments of the Passion are cramped by the ominous cross. Fontana's intention, fully realised, is to force the viewer into direct contemplation of the physical suffering of Christ and its grievous effect on the sacred assembly around him. Signed and dated l.c., oil "Prosper Fontane/ MDLXIII.". The Church of S. Giacomo, Italy, Almost certainly is the 'Deposition' referred to by two early sources as for the altar of the Church of Corpus Domini, Bologna. Whitfield Fine Art, London, pre 26 May 1994, London/England, Purchased by the AGNSW from Whitfield Fine Art 1994.